Updated resources to help you train new instructors in your organization! The Instructor Development Course is designed to teach instructor candidates various methodologies and techniques needed to be an effective educator, as well as how to comply with ECSI policies and procedures. Candidates will be required to present two prepared topics and handle questions and answers based on those prepared presentations. They will also learn by participating in course activities and by watching others during their skills and performance demonstrations. When candidates have completed this program and met its requirements, they will be confident and prepared to conduct their own courses. 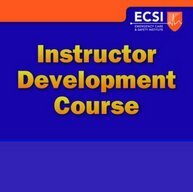 ECSI’s Instructor Development Course may only be offered by approved Instructor Trainers. For a detailed list of ECSI’s Instructor-Trainer responsibilities, call 1-800-716-7264 to speak with a membership representative.